"Baccalà alla Vicentina" (Vicenza style stockfish) is the most famous and important main course in the Province of Vicenza. 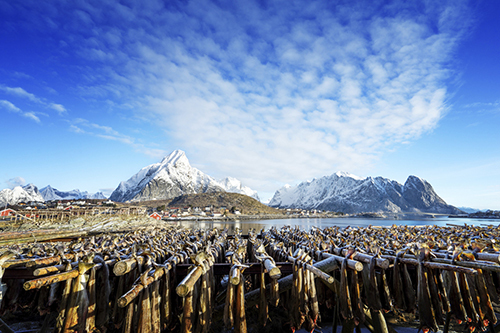 Stockfish is dried-cod coming from Lofoten Islands (Norway). Someone could think “What does Vicenza have to do with Norway?!? Well, the link between Vicenza and Lofoten Islands is as deep as long is the distance between both lands. One of the most well-known recipes of the Italian gastronomic heritage is deeply rooted in history. In 1432 the Venetian nobleman Piero Querini directed his cocca (ancient ship) full of wine, pepper, spices, perfumes and brocades, towards the northern ports. From the Captain’s log:”in Calese (Cadiz) because of the dumb pedota (helmsman) we ouched a rock and the rudder came out with serious damages”. The survivors reached with difficulty the Lofoten Islands where they found “cod hanging out to dry in the air and very hospitable women"... so that even today you may find some editerranean features among residents! A few years later Querini went back in Motherland and started to trade this unknown dried cod, called stockfish. However, this product spread across the territory just a century later thanks to the religious impositions of the Council of Trent about abstinence from meat. If fresh fish was always available for wealthy people and those living on the seaboard, the inland populations found in Bacalà the solution to the salvation of soul! The born of Vicenza style stockfish. 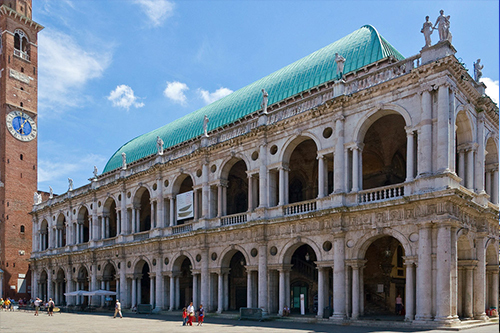 In 1890 Vicenza was a rich and peaceful town. One of the most popular haunts between nobles and welloff people was “trattoria Polenta e Baccalà” owned by Ms.Giuseppina Terribile Bianco, better known as Siòra Vitòria. Her way of cooking Baccalà was so appreciated that become in short a veritable cornerstone in Vicenza’s eating habits. Especially on Monday, the day that goldsmiths devoted to countryside trips, the trattoria swarmed with customers who enjoyed the famous dish, whose owner possessed the only surefire recipe: “Good raw materials, abundance of good oil, no concoctions, long preparation and slow cooking…”. The reputation of “Bacałà ała vixentina”(as written in local dialect) soon crossed the borders of the province. With the first cars, noisy and slow at first then more and more quieter and modern, elegant ladies and fashionable gentlemen reached the trattoria longing to taste the special dish under the pergola. Baccalà spread very quickly even in Vicenza families, providing contribution of fish in common habits, as it was not available until a few decades ago. The success necessarily led to the creation of some “variation on the theme” that can be found in the baccalà prepared all over the province. Still nowadays, Vicenza is one of the most important importers of stockfish dried by the Norwegian north wind. Due to a sort of historical misunderstanding, in Vicenza stockfish is called "bacałà" despite this term would more properly indicate the cod preserved in salting. Since 1934 Locanda Grego’s Baccalà is prepared according to the recipe of greatgrandmother Caterina, which does not differ from the forward looking precepts of Siora Vitoria: good ingredients, a lot of good olive oil, no concoctions and slow cooking. Floured and braised in a savoury sauce of oil, milk, garlic, onions, herbs and anchovy, this long and accurate preparation offers a main course with a very distinctive flavor, strong and delicate at the same. Her Majesty "Bacalà" is attended to the table by his Queen: “polenta”, the typical cornmeal mush made with local Marano De.Co variety. Countryside and surrounding fresh water. The area surrounding Locanda Grego is still today linked to rural culture, despite of presence of many important companies of varied sectors that trade in international markets. So many rich of fish that in the past people just rolled up their trousers and jumped into the canal with elementary traps or even a for and the dinner was guaranteed by small fishes: marsoni, nardaroliand fingerlings. In recent years, the growing awareness about culinary themes allows customers and restaurateurs to rediscover ancient tastes and traditions. Local Association “Pro Loco di Bolzano Vicentino” also created the De.Co. (Municipal Denomination) "Trout fingerlings of Bolzano Vicentino”. From spring to autumn we propose fingerlings fried or in saor (a typical marinade), Bolzanese pasta (with trout fillet and vegetables), trout tagliata, char, smoked trout salads and carpaccio. Handcrafted products combined with the cornerstones of the region: broccolo fiolaro, fresh mushrooms from Asiago, red radicchio from Treviso and Chioggia, white asparagus made in Bassano. We are always very glad about positive feedback that Customers give to this kind of inviting and unusual proposals.